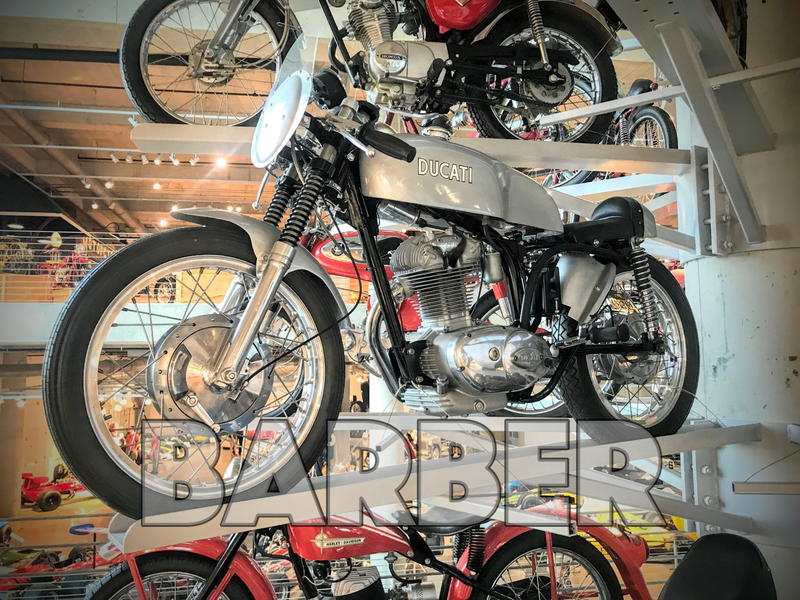 The first thing you notice driving into Barber Vintage Motorsports Park and Museum is the sheer size and ambition of the place. This place was built to expand, and there are commercial and retail opportunities all along the drive up to the museum. Located on the Eastern outskirts of Birmingham Alabama, the sprawling 740 acre compound that houses an IndyCar racetrack, Porche's driving school, Kevin Schwantz's Suzuki School, and the largest motorcycle museum in the world. Walking in through the front doors, there are motorcycles everywhere. Housing over 1500 motorcycles from the last century, this collection was started by George Barber in 1988, and originally opened in 1994. but moved to this facility in 2003. 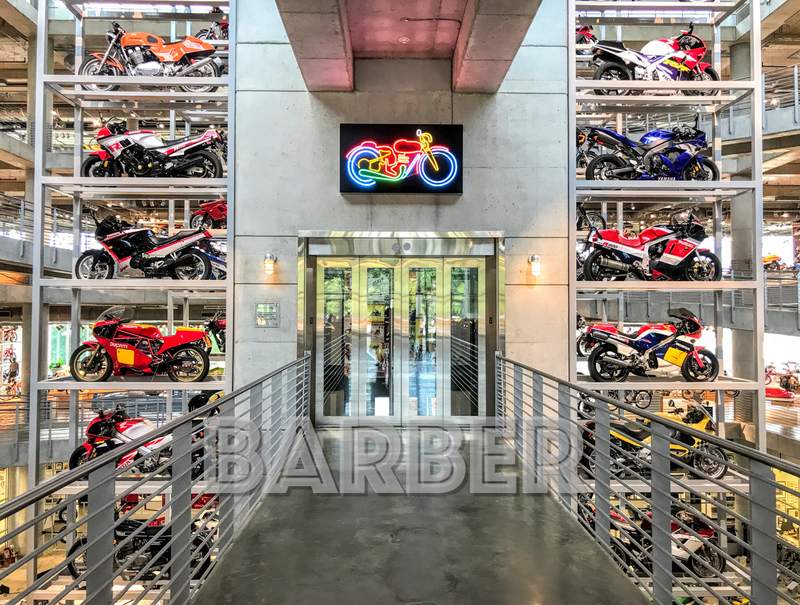 Two stacks of motorcycles line either side of an elevator that rises 5 stories high, housing 144,000 sq ft of stacked motorcycles, and when we arrived Barber had just completed another 84,650 sq ft expansion. 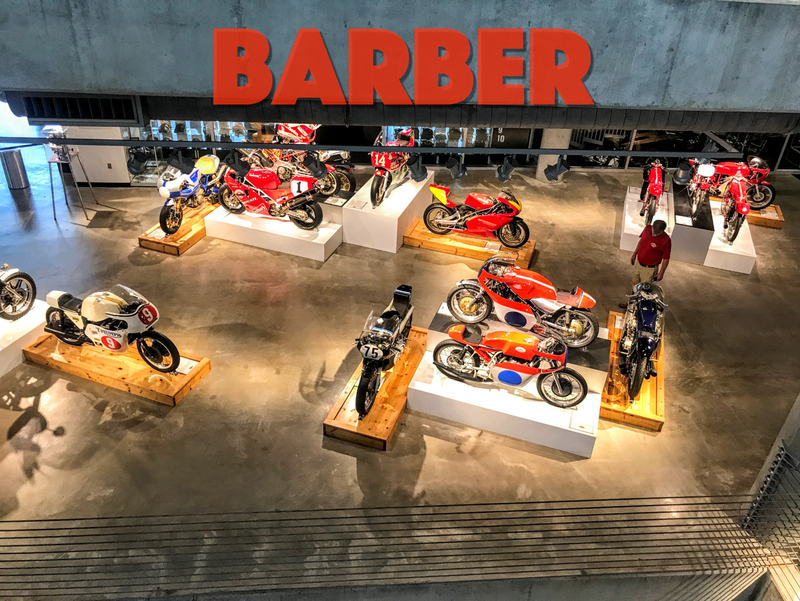 In addition to an incredible selection of rare, mostly vintage motorcycles, Barber is also the largest collection of Lotus race cars on the planet as well. Others are stacked across the wall on shelving, like these early Italian singles. or simply stacked on top of one another. Most of the bikes are incredibly rare, and I wish I had more time to give each bike its due. However, this was nearly impossible due to the sheer size of the collection of rare bikes. on this MotoAmerica and IndyCar circuit track. George Barber Sr. built the largest dairy empire in the country promoting the widespread adoption of pasteurized milk, whose son (George Jr.) raced Porsches in his youth in the 1960's, and apparently became a motorcycle aficionado as well. After selling the dairy business, George Barber (Jr.) turned his attention to collecting the the largest compliment of motorcycles in the world, a feat that has largely been accomplished, but which is by no means complete. There is a tribute to John Surtees, one of the most successful MV Agusta riders, and the only person to win both motorcycle and Formula 1 Grand Prix races, who consulted George Barber on building the contiguous racetrack. I was actually surprised at how many European and Italian bikes were featured in the museum. Out of 1500+ bikes, there were fewer than 100 Harley Davidson'\s on display. However, there were plenty of unique and one-of a kind motorcycles on display, like this original 1974 750SS Imola Green Frame parked next to a 1977 750SS "Old Blue" replica that Cook Neilson raced to victory in the 1977 Daytona Superbike race, two events that launched Ducati into the racing dominance over the next several decades. as well as early Ariel machines. More contemporary racing Ducati 1098s and MV Agusta F4 bikes. For some reason, I though Dennis Hopper's "Easy Rider" Captain America chopper had been destroyed, but here it sat. A Yamaha and a Velocette race bike led the line in this winding display. I didn't spend too much time in the early motorbike section, but I'd like to go back and do my due diligence. Motorcycles stacked upon motorcycles stacked upon motorcycles. There were many rare race cars as well, like this 1969 Lotus Type 64 Indy Car. but wished I had days to explore. Beveled Desmos next to dirtbikes, with the racetrack in the background. The carpet is a nice touch. BSA and BMW side by side. Old Moto Guzzi, Parilla and MV Agusta singles. as I hadn't planned this as part of the trip. There's a Ducati Supermono in the background.